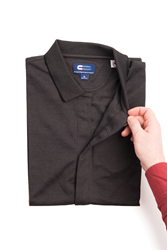 MagnaReady and Powered by MagnaReady shirts use patented magnetic closures in place of buttons, zippers or snaps for easy dressing. MagnaReady®, The Original Magnetic Clothing Company®, is making adaptive clothing more readily available announcing its patented magnetic closures are now being used by 14 retailers to introduce and expand adaptive clothing options online and in stores. MagnaReady® or MagnaClick® branded short and long sleeve dress shirts, knit polos and khaki pants for men as well as school uniforms for boys and girls are the first pieces to be introduced. MagnaReady® expects to add more items to its collections at retailers in the future as more buyers recognize the need and demand for stylish adaptive clothing. MagnaReady® powered clothing items are now available on Amazon, the Zappos adaptive channel, at retailers including DXL, Men’s Warehouse, Macy’s Kohls, JCPenney, and will be available from Duluth Trading Company later this year. Land’s End is also previewing children’s school uniform pieces including polos, dress shirts, pants, shorts, skirts and dresses, which will be available to order this fall. For more information about MagnaReady® clothing items and retailers offering powered by MagnaReady® clothing options, please visit http://www.magnaready.com. Necessity was the mother of invention for Maura Horton when she came up with the idea for MagnaReady®. Maura was inspired when her husband, a college football coach, had to rely on a player for help when the effects of Parkinson’s Disease prevented him from buttoning his shirt. Determined to help her husband remain independent, Maura came up with the idea of a magnetically infused shirt that did not require finger dexterity to wear. MagnaReady® is the original magnetic shirt company. For more information, visit http://www.magnaready.com.